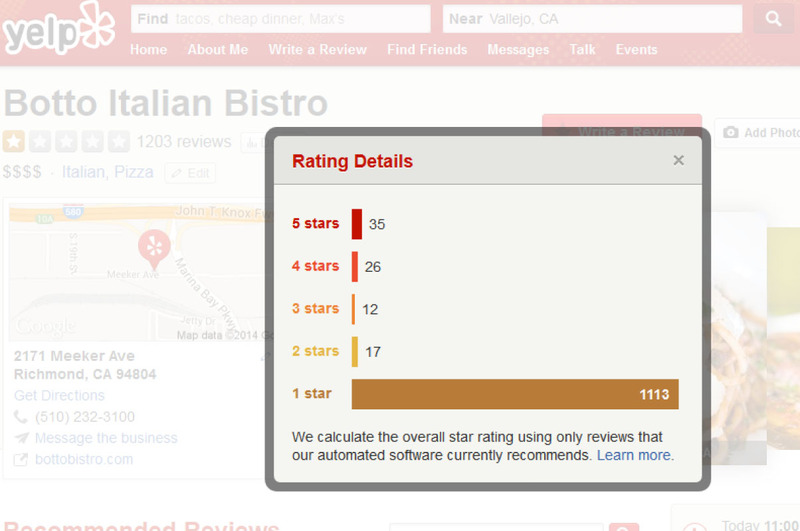 It's official, Botto Bistro is the worst restaurant ever on Yelp and in Yelp's world. We are the only One star restaurant on Yelp, and our goal is finally reached! Get an immediate 50% OFF any pizza for your One star review. 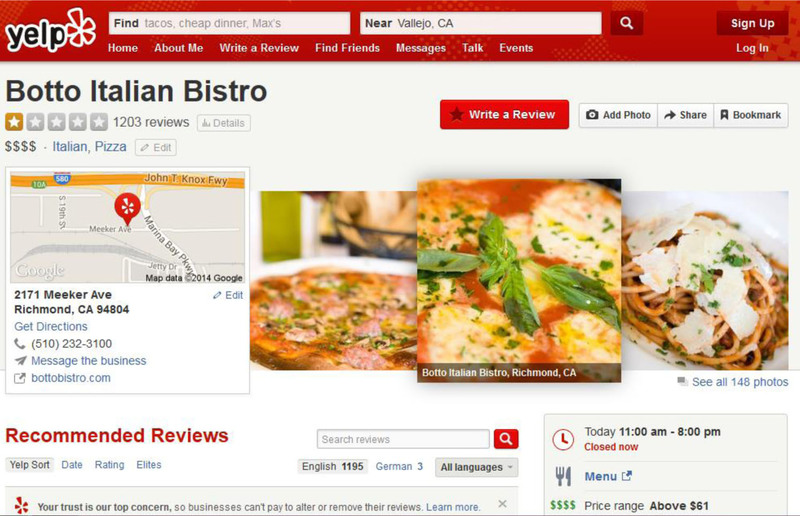 Take a quick screenshot to show it to us, as Yelp's special Botto team removes our reviews as fast as possible. Busy people...so far they removed just about 3,000 of Botto's one star reviews. How cute and adorable is that? They are busy people thanks to us. but to get a one star score on Yelp it takes way more. You need balls, bad attitude (Italian if possible), the media and the support of the public. In other words, you need a revolution. over 2600 one stars reviews written with sarcasm by Botto supporters from all over the country and also overseas. Quite a result for the greatest "vaffanculo" in Yelp history. We promised to our loyal customers that we were going to be the worst restaurant on Yelp, and here you have it. We never doubted for a moment that the American public would give us such important support. In fact, this amazing reward is the result of what people can do together. This Yelp One star is all yours, dear friends. 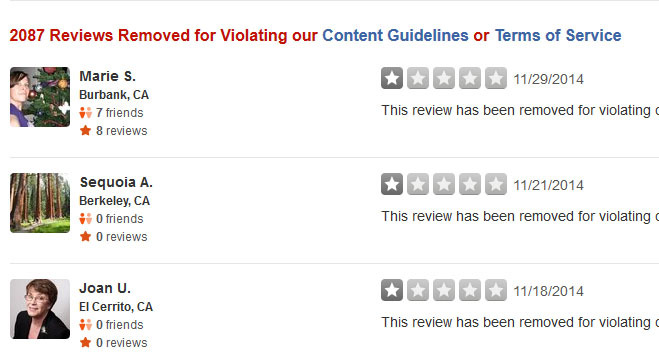 Thank you to all the thousands of fans who wrote these incredibly funny reviews - we really hope they won't be lost in a useless Yelp file of "removed reviews", they were too funny. It is official that our restaurant is purposefully out of the race to get the best reviews. We leave Yelp Headquarters with the hard job of deciding where to place our 2,600 one star reviews. They can filter them, remove them, squeeze them, take them out for an ice cream or even to Disneyland. 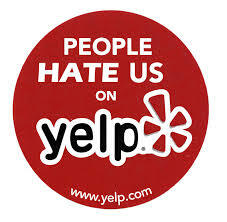 We have a wonderful idea our own of where Yelp can stick our 2,600 one star reviews now.....but it's on them. It is no longer our concern. by a small Italian restaurant with 10 tables with overpriced, sucky food, a bad attitude and zero interest in making it better. After Botto Bistro started to troll Yelp this is what she had to say about our campaign: ‘Botto Bistro is cheating itself out of customers’. And that was two years ago, when they still had no idea Botto Bistro would open the biggest crack in their ship since the time of the Titanic. There are a few way to interpret their statement dear friends. If Yelp’s spokeswoman was referring to her personal friends as our customers, obviously we were pretty safe from the start. In case she actually has some friends it is clear enough that they are not listening to her. in exchange for a one star rating, all without Yelp’s approval of course. With a few dollars off a sucky pizza we got a few million dollars worth of free publicity for two years, and it is still working just fine, because they are still removing reviews after reviews daily. Finally, if that statement was intended as a threat she totally scared the hell out of us. if they don’t agree with them. Armed with Harvard studies and statistics he boasted to the world how impossible it would be for any business to be successful without Yelp. and your friends won’t like you anymore. His prediction can put Nostradamus to shame apparently. you’ll need to be watered twice a week. I mean Mr Vice president Nostradamus didn’t guess one statement right out of the dozens he made. Even lady luck really does not want to kiss this guy one time (And if you look at him you’ll know why). Anyway, do not go gamble in Vegas with Vinnie from Yelp, just a friendly suggestion. Reading their statements today the words of our Mama in Italy come into our mind “think before you open your mouth’. Obviously the Yelp crew didn’t get mama’s memo. At this point even the Mickey Mouse Club’s spokesperson has more credibility than these guys. so they could communicate with us. it would probably have worked better. Yelp's threatening letter and our reply. Enjoy! I'm contacting you from the Yelp User Support Team because we've received complaints from the community that you may be offering incentives in exchange for reviews. on a listing with suspicion. be removing reviews in exchange of vague explanations to loyal customers. loyal customers and users who now eye your site with suspicion. If you are offering this explanations in exchange of removed reviews, we ask that you immediately discontinue such activity. We are the ones who did this to you.